I have a very clear memory of taking this picture. We were in Copenhagen visiting our older daughter and her family. I’d gone with my grandson to his piano lesson. We’d been driven there, but were expected to make our own way home. 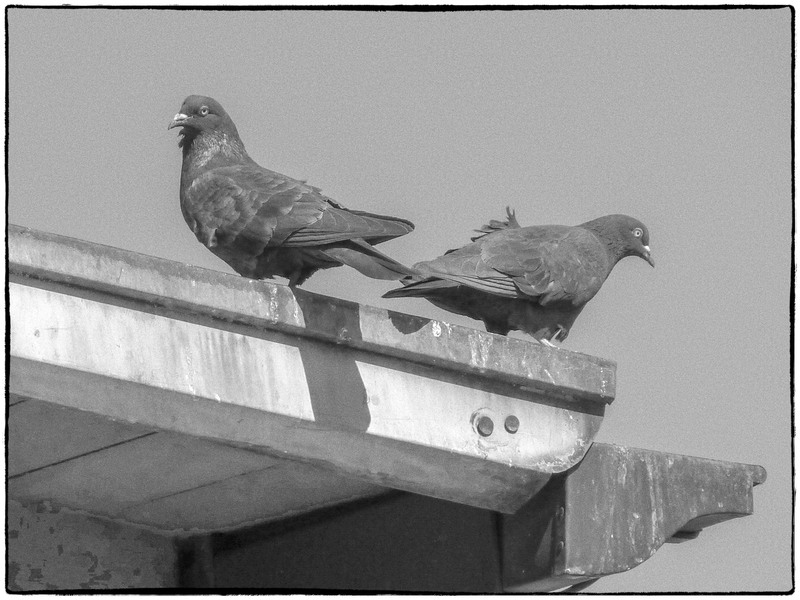 I recall that we were taking the train so we walked to the nearest station and while we were waiting for the train to arrive I spotted these two pigeons on the roof. It was taken in May, 2011 with a Panasonic Lumix ZS3 – a compact 10 megapixel point and shoot camera. Yes the images were noisy and the focus tended to lag. In poor light it was next to useless. But it was very small and light and had an excellent 12x zoom. It took more than adequate pictures in good light. I have many pictures that I would never have gotten at all otherwise because: 1) I probably wouldn’t have had a camera with me; and 2) even if I did have a camera a shorter focal length lens would not have allowed me to get the picture.